I've just paid it online by credit card. It works out at 38 quid. It's easy to just say f@ck 'em if the ticket isn't yours but the qualified legal experts say pay it as they WILL chase and get you for an ever-increasing amount if you don't. Feeling lucky punk....? The one thing I've found out is not to exceed any speed limit by more than 20kph or the fine is considerably more than 45e. and you pay way more than a 'paltry' 45e. It was 6 AM one morning in July 2011 when I was 8 years younger and a good 2 stones lighter. I was cycling a push bike up Mont Ventoux from Bedouin and I was still in the forest nearing Chalet Reynard when I heard the sound in the distance. It sounded like a bunch of TT racers wringing the necks of their bikes. The noise got closer and louder until a mixture of exhaustion, fear and self preservation had me leaping off the bike on to the rocky verge. 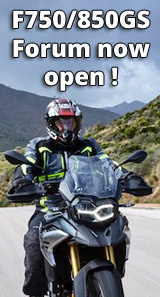 France used to be a playground for us bikers too but not so much anymore, they have non-union speed cameras that flash you from behind, work for minimum wage 24/7 and unlike us fair minded Brits they hide them behind trees, signposts and bridge parapets with no warnings. Don't be surprised when the par avion letter arrives on your door mat. Me & missus rode up Mont Ventoux from Beduoin on our ST955, us & around a 100 cyclists saluting Tommy's shrine, old boys in overstretched lycra having a great time at the top holding their bikes in the air under the Mont Ventoux sign. Worst bit was erecting the tent in that wind. I tried to pay mine today (car did it!) But wouldnt accept credit card and said go to bank.....at least iys not points . I paid online by Bank transfer, no probs, they gave the account, sort code & ref number to use. My credit card was accepted ok? As long as you enter the offence number (remote payment number) and key from the bottom of the orange payment notice sheet and your credit card (Mastercard or Visa) is valid it should work on the link below. Thanks squirrelly and paulhere, I filled in the online bit and entered all the credit card details, so when I was waiting for a ' sucessfully completed' message it just said error. Ill wait to see if its on the card before paying again! Interestingly, I was doing 98 in a 90 limit. They say the used speed is 93 (98 - 5kph) but the explanation on the back said its calculated by speed -5 kph, -5% so by rights that should bring it below the 90 limit. But Im just going to pay, rather than contest.......though it was my wifes car I was driving....?! Presumably they mean actual speed -5kph, so that is the same as the used speed, the 5kph being your bonus amount (like the 10% plus 2mph used in the UK but less generous). Otherwise they'd be taking 5kph off twice. Im taking Mt tiger from the states and running a US plate.....whats the chance of the bill ever getting to me? If I get pulled over can I pay the fine by the side of the road?